Here’s the basic Family History Sunday School Class—with lesson materials and videos. The Temple and Family History Course is a beginning-level class designed to help Church members start their family history research and perform temple ordinances for their ancestors. 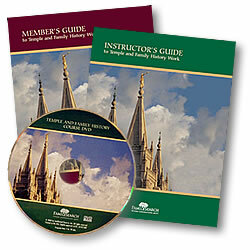 The doctrines related to temple and family history work provide the foundation for the lessons. Individuals who are already engaged in temple and family history work can also benefit from the course by learning about additional resources that are available. Here’s where you’ll find the class materials. Family History Companion provides additional class resources. Before you proceed with your Family History Sunday School Class, please review this brief video on Principles for Successful Family History Classes. It offers excellent insights on preceding the class with individual hands-on workshops for the ward members. Seeking out our deceased ancestors and performing temple ordinances for them is easier than ever before. – scan the icons to see which ones are ready — look for the green arrows! Family history and temple work bring joy to those who engage in it — and salvation to their kindred dead.